Is it us or has it just got more 'virtuoso funk' in here? 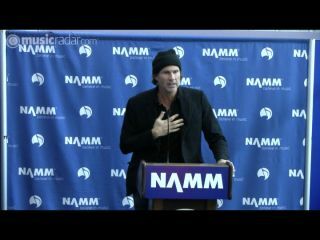 The Percussion Marketing Council injected a bit of glamour into its NAMM press conference on day two by inviting Chad Smith to talk about the new PMC initiative he's involved in. The 20/10 scheme will see the Chickenfoot and RCHP drummer visit schools to deliver talks and clinics in the hope of inspiring more young people to take up an instrument. Which is considerably more exciting than the music lessons they had at our school. Check out Chad's bit at the conference in the video above.